Abu Dhabi, the capital city of United Arab Emirates, may be lesser known than its more illustrious neighbouring city, Dubai, but offers unique experiences to its visitors that no other city does! Located in the Arabian Peninsula, just adjoining the Arabian Gulf, Abu Dhabi is quickly becoming one of the most visited cities in the Middle East for its topnotch infrastructure, coupled with well preserved cultural heritage. Neil and I recently visited the city in partnership with Visit Abu Dhabi, and this happened to be our first trip to a Middle Eastern country! 3 days in Abu Dhabi, and needless to say, we were blown away by the Emirati style of hospitality – larger than life, but oh so warm! Based on our experiences there, we have curated this 3-day Abu Dhabi itinerary to help you plan your trip. You may ask – why 3 days? 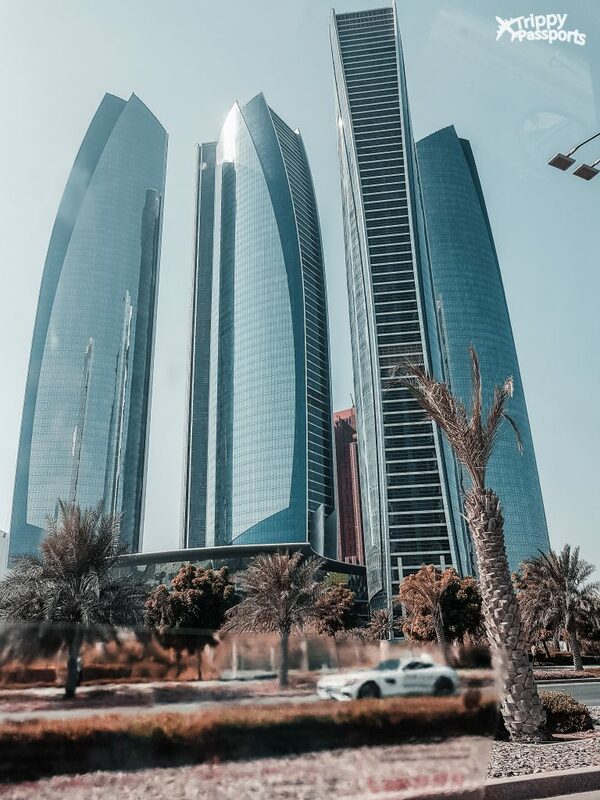 Well, that’s because from our personal experience we thought that 3 days would be the right amount of time to explore the best of Abu Dhabi, without rushing too much and leaving enough space for leisure and relaxation. 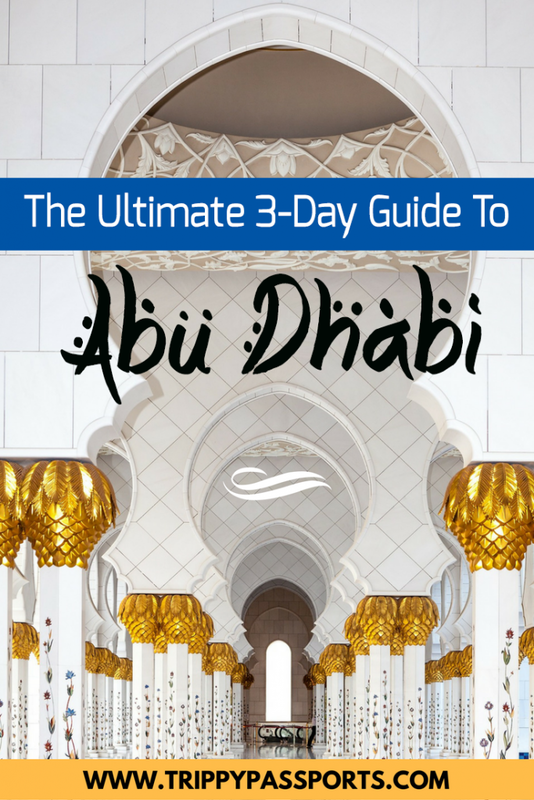 If you have always felt unsure of the things to do in Abu Dhabi in 3 days, you have come to the right place! This itinerary is a mix of fun activities, with a touch of culture and heritage and is perfect for couples as well as those travelling with kids. Abu Dhabi is not just about the skyscrapers you see in photos on the internet or in glossy magazines. There is so much more in the city waiting to be explored and this could be the perfect start to your exploration of the Middle East! Our idea of travel is to take it slow and easy instead of cramming too many activities within a short span. Hence, this itinerary is designed in a way that will allow you to soak in all the new experiences around you and also allow enough time for relaxation. After all, what’s a holiday if you don’t come back refreshed and recharged? Having said that, this Abu Dhabi itinerary is also completely customizable as per your individual needs. If nothing else, this list of things to do in Abu Dhabi could at least kick-start your travel planning process! How about starting your 3 days in Abu Dhabi with a day-long tour of the city’s most popular spots? The hop-on-hop-off bus service provided by Big Bus Tours is perfect to get you acquainted with Abu Dhabi’s tourist attractions. A Classic 1-day ticket will allow you to start your tour at any time between 9 am (first bus at Stop #1 Marina Mall) and 5 pm (last bus at Stop #1) and explore the city at your own pace all day long. Hop off the bus at whichever stop you like and spend as much time as you want. There are buses at every stop every 30 minutes so you have complete freedom to plan your day as per your interests. From personal experience, I suggest the earlier you start the tour, the better it is, so you don’t have to rush through the day and can spend enough time at each of your chosen stops. 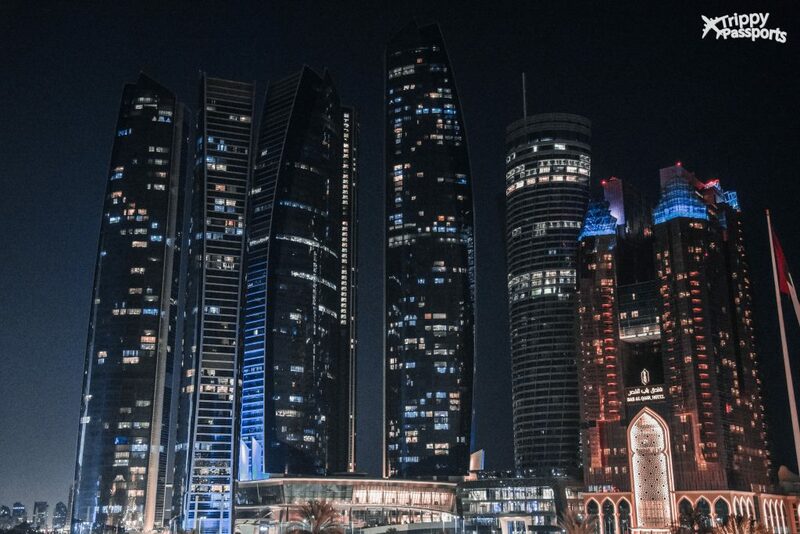 Get a glimpse of these iconic, towering structures adorning the Abu Dhabi skyline up close. I have to say they look quite magnificent in daylight, with the morning sun reflecting off the glossy blue glass exterior. If you want, you also have the option to go all the way up to the Etihad Towers’ 74th floor to their Observation Deck for a bird’s eye view of the city. 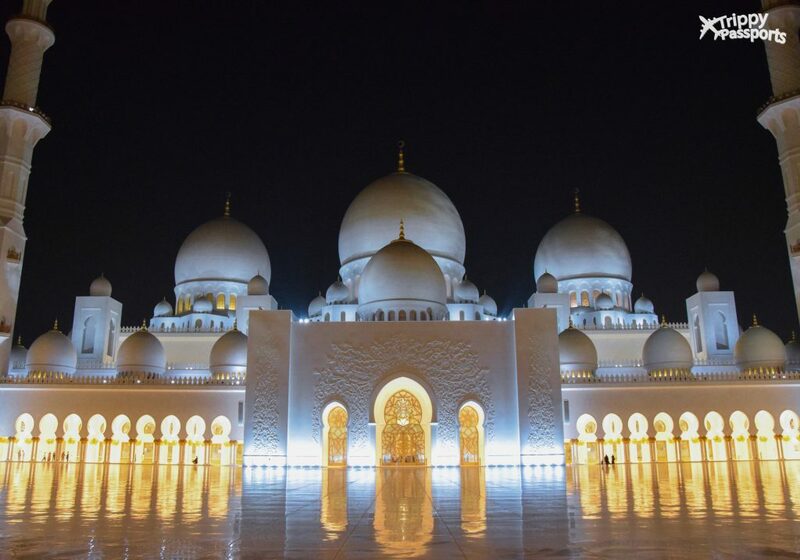 This grand mosque truly is the centrepiece of the UAE’s history and culture. 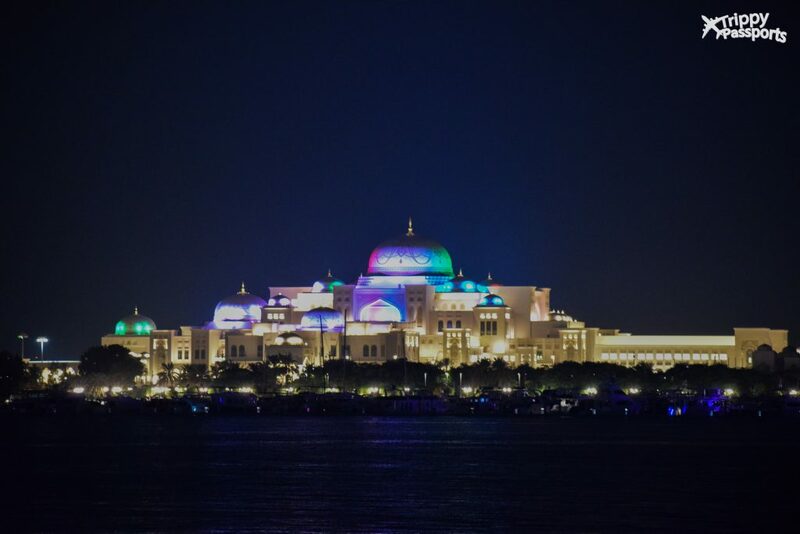 Named after the erstwhile President of the nation, this is the largest mosque in the UAE. Based on my personal experience, you’ll need at least an hour to explore the entire mosque. Stroll through the walkways lined with intricately-designed gold and marble pillars, that leads to the main prayer hall. Once inside, don’t be surprised if you get swept off your feet by the sheer grandeur and magnificence of the decor. Adorned with the largest Iranian carpet ever woven and some of the largest crystal chandeliers in the world, this mosque is a sight to behold! 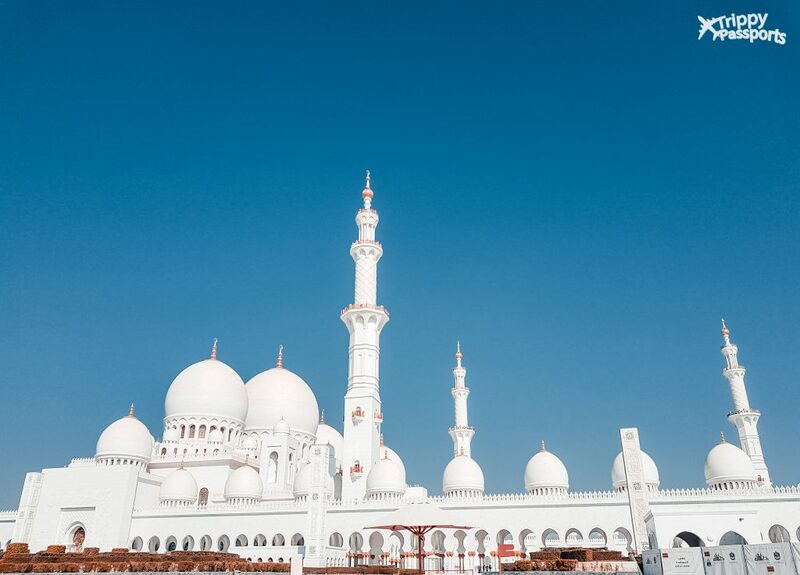 Be it the Arabic-style minarets, the stunning contrast of the pure white domes against the clear blue sky or the calming pools of water on both sides of the entrance, the Sheikh Zayed Mosque makes you feel grounded and fills you with a sense of peace and gratitude you’ll rarely find elsewhere! This is a luxury apartment and shopping mall duo that really reflects the Emiratis’ love for opulence. But more than that, why I recommend a visit here is the beautiful waterfront at the back of Galleria Mall. 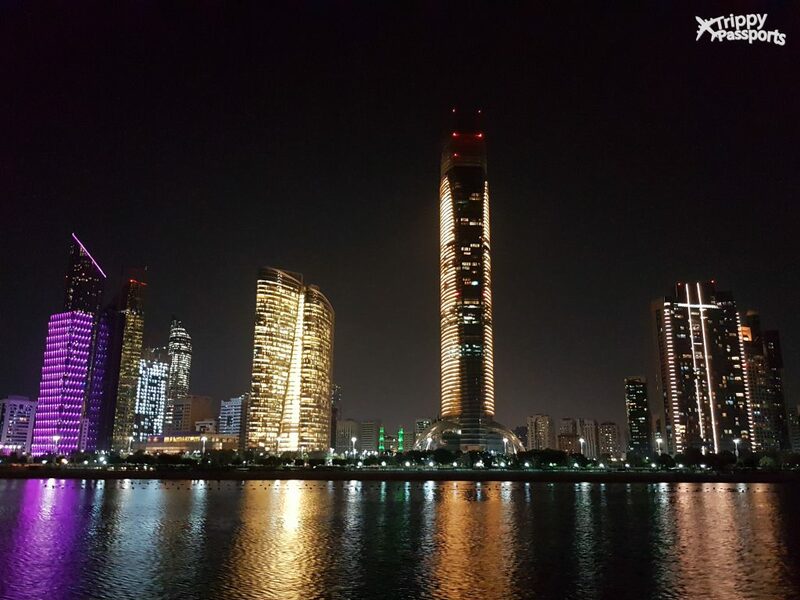 You can get a stunning view of the Abu Dhabi skyline from here while enjoying a walk overlooking a part of the Arabian Gulf. By the time you get here on your Big Bus city tour, it’ll probably be lunch time. So find yourself a cafe or restaurant by the waterfront and enjoy a sumptuous meal with a view to die for. This is an 8 km long stretch of sea beach that extends along the Abu Dhabi Corniche Road. Imagine not having to leave the action-packed city life to find a pristine beach in the heart of the city! How cool is that? 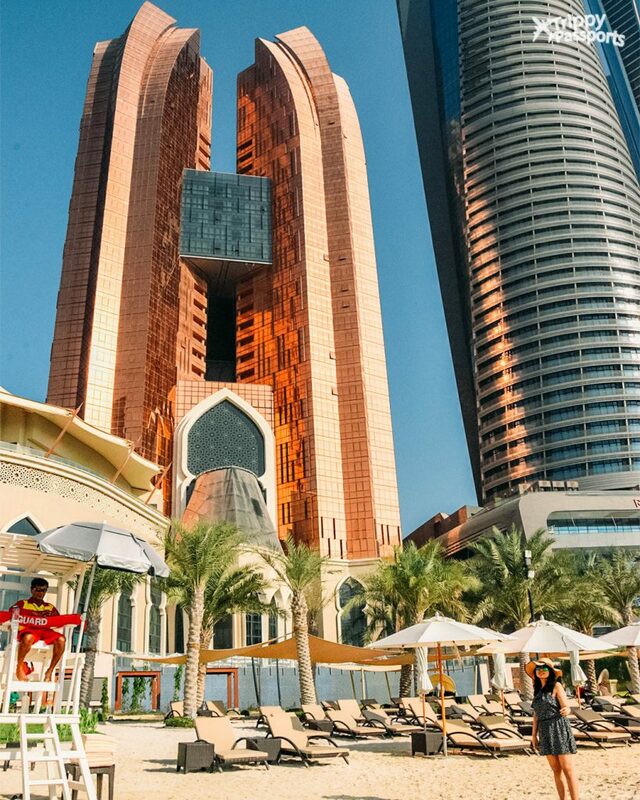 The corniche has children’s play areas, restaurants and of course, extremely safe sea-bathing areas watched by lifeguards. You can either choose to take a quick dip or simply take a leisurely walk along the beach before moving on to the next stop. The WTC Souk is a shopping mall, one half of which is built like an old-fashioned Emirati market, also called a Souk. Even if you are not too keen to visit the mall, visit this place to get an idea of how the Emiratis used to shop in the yesteryears. Hand-woven carpets, jewellery, spices and herbs all in one place, taking you back in time. As the name suggests, the Heritage Village has been constructed like a traditional Emirati village of the past. You will get a chance to walk around the village, check out little shops displaying various forms of craftsmanship – metal work, carpentry or pottery. If history intrigues you, Heritage Village is a must-visit! The Big Bus Tour in Abu Dhabi ends with a Dhow or Traditional Boat Cruise along the Corniche. 4 cruises depart daily from stop no.15 at 10.30 am, 11.30 am, 3.30 pm and 4.30 pm. Since this cruise only happens during the day, you’ll be able to get a clear view of the Abu Dhabi skyline as you sail past towering building. However, my personal recommendation is that you spend more time exploring the city stops with Big Bus throughout the day. In case you are worried about missing out on the boat cruise, which does seem lucrative, worry not because I’m going to share a better option for a Dhow Cruise with dinner in the next section. End your first day in Abu Dhabi with a relaxing cruise from Tour Dubai that operates Tour Bahr in Abu Dhabi, which is a 5-star dinner cruise that sails along the Corniche road, gliding past the glittering Abu Dhabi skyline. 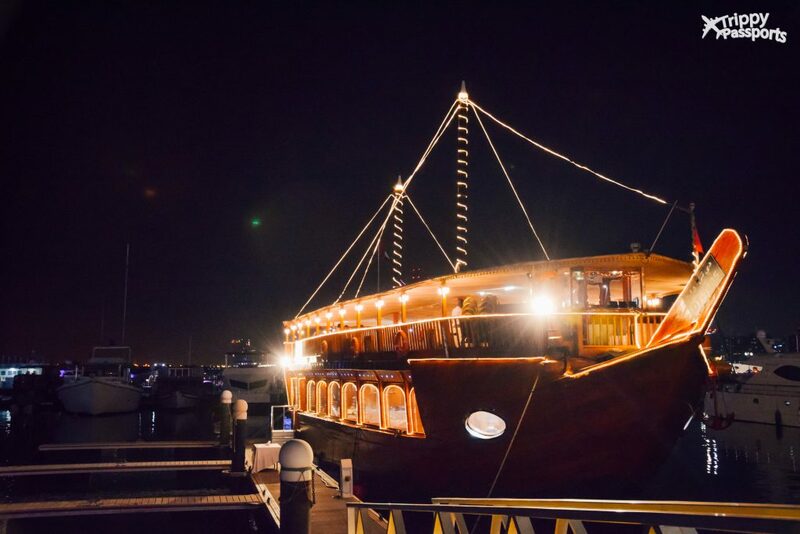 You will be sailing on the iconic Dhow or traditional wooden boats that have always been a prominent feature in Abu Dhabi’s cruising scene. The cruise lasts for 2 hours from 8 pm to 10 pm and includes a sumptuous 3-course spread. The food is primarily Middle Eastern and is one of the best that is served on board among all dhow cruises in Abu Dhabi. Indulge in the flavours and music of the UAE while enjoying the gorgeous, uninterrupted view outside. The cruise starts and ends near Marina Mall and is a delightful experience – truly one of the best things to do in Abu Dhabi at night! Now that you’ve become acquainted with the beautiful city of Abu Dhabi, it’s time to venture further! Day 2 is all about adventure and adrenalin! Gear up and head over to Yas Island, about 30 minutes drive from Abu Dhabi. Yas Island is home to the Yas Waterworld and the Ferrari World, both iconic destinations in their own right. Start your day at the Ferrari World, which is the world’s first Ferrari-themed entertainment park. 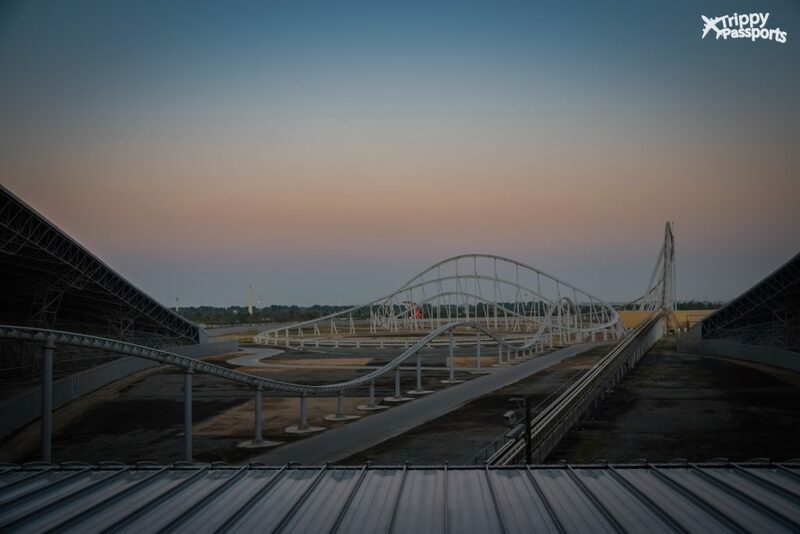 With more than 20 unique rides to boast of, this theme park is probably the closest one can get to feeling truly fast and furious! 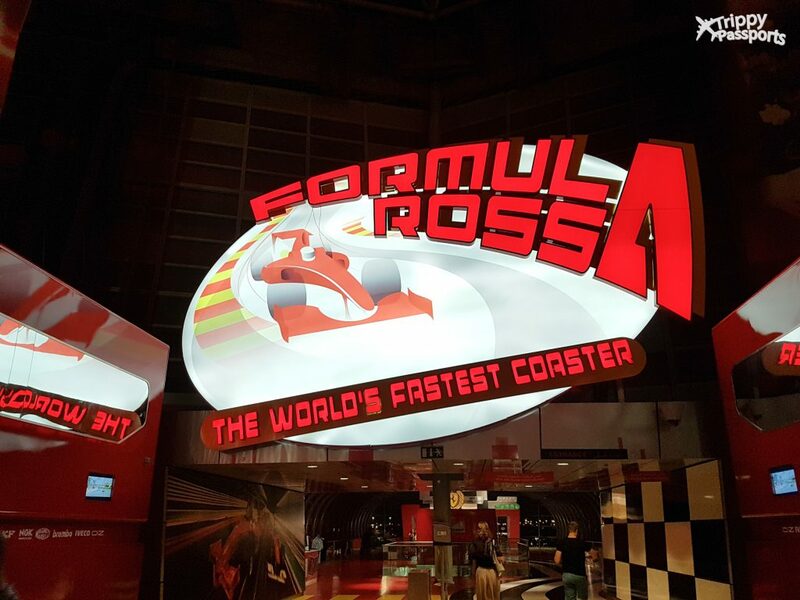 The Ferrari world is also home to the fastest roller-coaster in the world, the Formula Rossa, that reaches its top speed of 240 km/hour in a matter of a few seconds. The thrill and the excitement are beyond anything you may have experienced so far and something that is best experienced firsthand. Apart from that, there are several rides to stimulate your sensory experiences and are a treat for both adults and kids. The Ferrari World experience is truly one of a kind and manages to transport its visitors to a world of passion and excitement! It is easy to lose track of time when you’re having fun, right? But there’s more in store for the latter half of the day once you have finished exploring Ferrari World. Hop over next door to the Yas Waterworld, an Emirati-themed aquapark with 40+ unique rides to choose from. If splashing around in water makes your inner child come out, then this is the place to be! 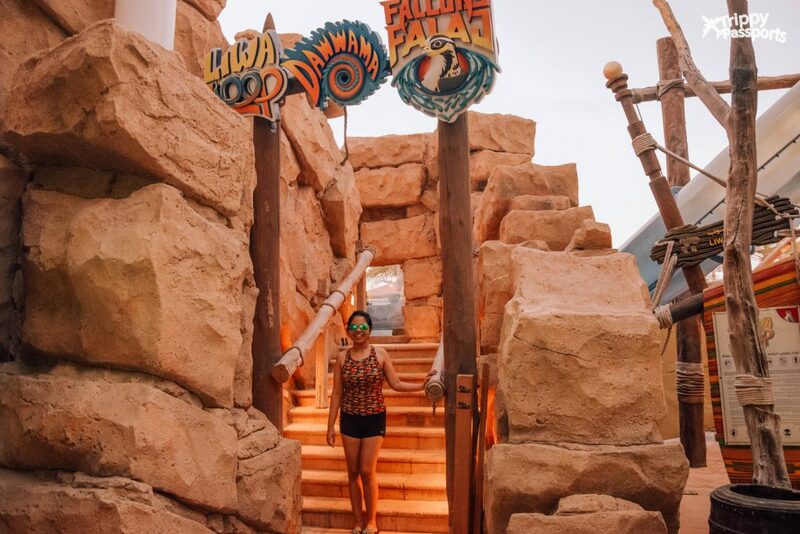 Equipped with crazy tornado water slides, suspended roller-coasters and other adrenaline-filled water-based rides, the Yas Waterworld is the perfect place to let go of your inhibitions. If you have at 3 days in Abu Dhabi, a visit to Yas Island is a must! Whether you are one who thrives on adventures or one who prefers a laid-back life, Yas Waterworld and Ferrari World must be on your list of things to do in Yas Island. Not only are they a lot of fun, they are also extremely futuristic and give you a glimpse of high-end technology the UAE is well known for. Make your last day in Abu Dhabi memorable by taking things a little slow. Let this be a day of exploring the city at your own leisure. Start your day off with some retail therapy at the Marina Mall. This is the same mall from where you would have first boarded your Big Bus on day 1. It is true that the neighbouring city of Dubai is known to be the ultimate indulgent shopper’s paradise, but Abu Dhabi is definitely a close second! 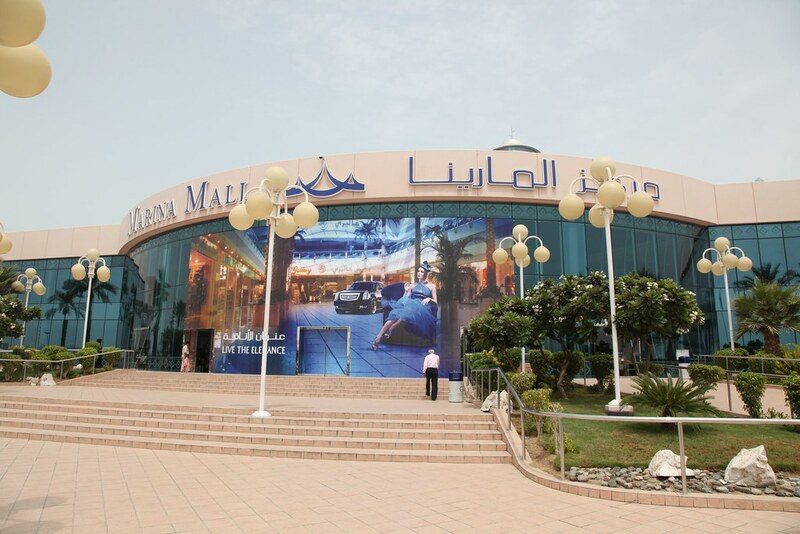 Marina mall is home to an ice skating rink, a movie theatre and all the top end brands that your heart desires! Shop here to your heart’s content or have a meal at one of the quaint restaurants in-house and you will be left wanting more! Despite a thriving modern retail environment, what’s a trip to the UAE without a visit to their old-school markets? Also known as Souks, these Emirati markets were how locals originally used to shop. 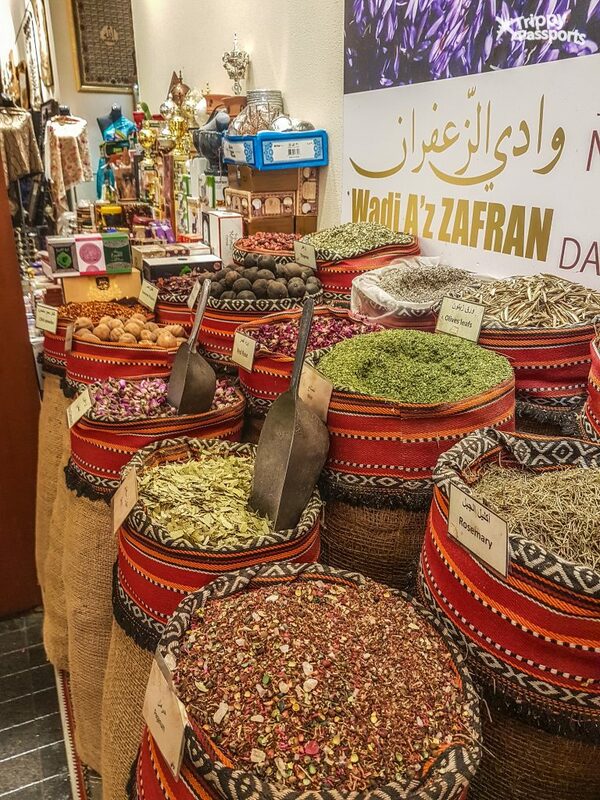 Starting from exotic herbs and spices to perfumes and handicrafts, these souks are a treasure trove of local goodies. Make your way to Abu Dhabi’s famous Fish Souk to catch a glimpse of fish trading, the Emirati way. This souk is located close to the city’s main port, Mina Zayed, where the day’s catch is offloaded. Right across the road is Abu Dhabi’s Al Mina Fruit and Vegetable Souk, a vibrant market filled with fresh, local produce. Shops lined neatly with a variety of fruits, vegetables, herbs and dates are a treat to the eyes even if you have no plans of shopping here. If nothing else, this makes for an excellent photo op with its burst of colours under the bright Abu Dhabi sun! There is also a popular Carpet Souk in the vicinity if you want to check out local mattresses, carpets or cushions to take back home. 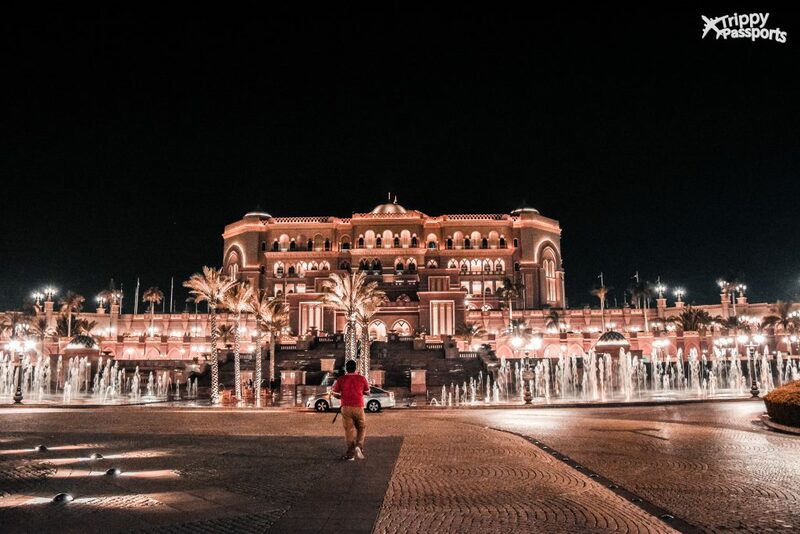 A shining star in the city’s glamorous skyline is the Emirates Palace Hotel, a defining architectural landmark in Abu Dhabi. If you are wondering why I would ask you to visit a hotel, let the image below do the talking. This brings you to the end of your 3-day Abu Dhabi itinerary. If you have always been under the impression that a trip to the UAE means only visiting Dubai, this list of things to do in Abu Dhabi in 3 days should give you enough fodder to consider planning a trip. But what if you have only 1 day in Abu Dhabi? This is a question we often get because many travellers have an Abu Dhabi stopover en route to another country. And it is fair to want to grab the opportunity to see a new city in whatever little time you have in hand. In such a scenario, we suggest you pick up your favourite tourist attractions in Abu Dhabi from the detailed itinerary above, to fit your individual taste and depending on the amount of time you have. 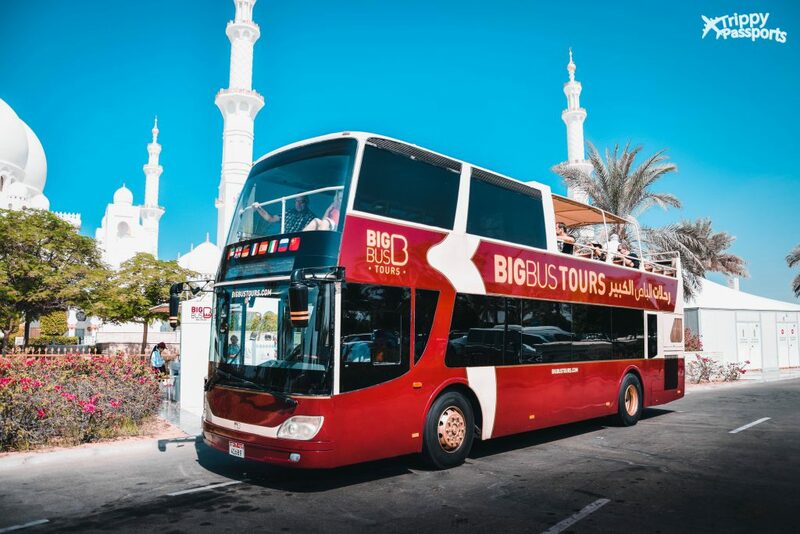 Maybe an Abu Dhabi sightseeing tour with BigBus Tours would be ideal? Or maybe you’ve always dreamt of visiting the Ferrari World and tasting the adrenalin rush for yourself? Whichever way you choose to go, spending 1 day in Abu Dhabi will always be a good idea, with something available for everyone! In addition to the list of Abu Dhabi’s tourist attractions, I have added the next section to further help you plan a trip to Abu Dhabi. By Air: The Abu Dhabi International Airport is the hub of Etihad Airways and is serviced by all major airlines from across the globe. Jet Airways also has a tie-up with Etihad Airways, so if you are based out of India like us, there are multiple direct flights to Abu Dhabi from many Indian cities operated by both airlines. By Road: Another popular way to get to Abu Dhabi is by flying into Dubai and taking the road to the capital city. This according to me is the most convenient way to travel between the two cities since cheap flights to Dubai are very easy to find these days. Buses to Abu Dhabi can be boarded from either of these 2 stations in Dubai – Ibn Battuta Metro station (if you are in the newer part of Dubai like Marina, JLT etc.) or Al Ghubabiba bus station (if you are in old Dubai), all day long. Bus tickets cost only 25 Dirhams per person and will drop you at the Abu Dhabi main bus station near Al Wahdah Mall. Buses are well equipped with modern seats and other facilities, making the journey extremely comfortable. Depending on traffic, the travel time between Dubai and Abu Dhabi is approximately 2 to 2.5 hours. If you are spending a few days in Dubai, make sure to check this list of things to do before you leave. Alternatively, you can also drive down from Dubai to Abu Dhabi by renting a car locally. If that’s what you plan to do, make sure you have a valid international license to show. This option is albeit more expensive than taking a bus but can be a lot of fun if you love driving and road trips. For a complete lowdown on the available transportation options, read more about how to travel from Dubai to Abu Dhabi. Getting a visa for UAE is really not as difficult as it may seem. Firstly, if you are an Indian passport holder and happen to have a valid US visa, you do not need to apply for a UAE visa in advance. You are eligible for a visa on arrival, that costs 105 Dirhams per person if your port of entry is Abu Dhabi. All you need to show is your valid passport and US visa at immigration. This is exactly how Neil got his Abu Dhabi tourist visa. However, for everyone else, the process is slightly different. If you are flying to UAE via Emirates Airlines or Etihad Airways, the airlines themselves will be able to arrange the visa for you. Alternatively, if you are flying any other airlines like Jet Airways, which we did, it is very easy to apply for a visa through an authorised travel agent in your city. I did mine this way and paid INR 6500 including the visa fees and travel agent’s fees. The visa came to me in about 5 working days. 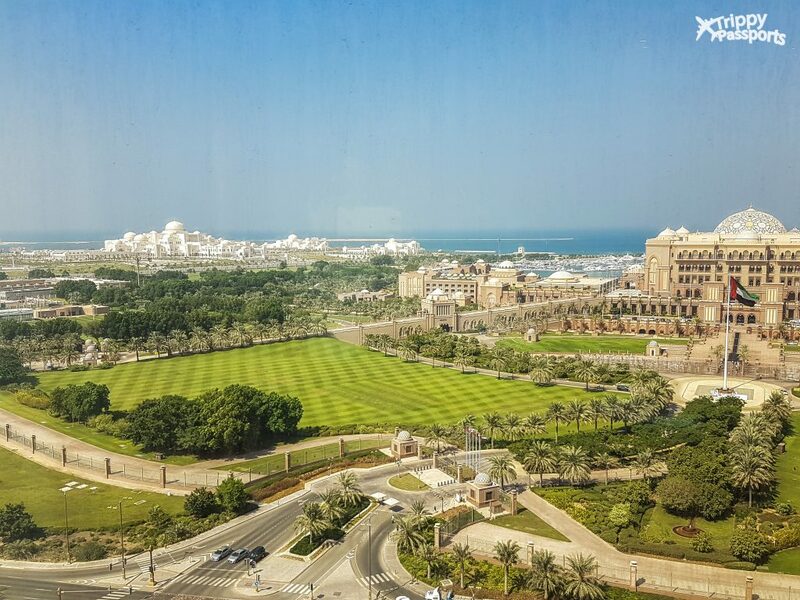 Bab Al Qasr Hotel was a beautiful property where we put up at during our trip to Abu Dhabi and it exceeded all our expectation! 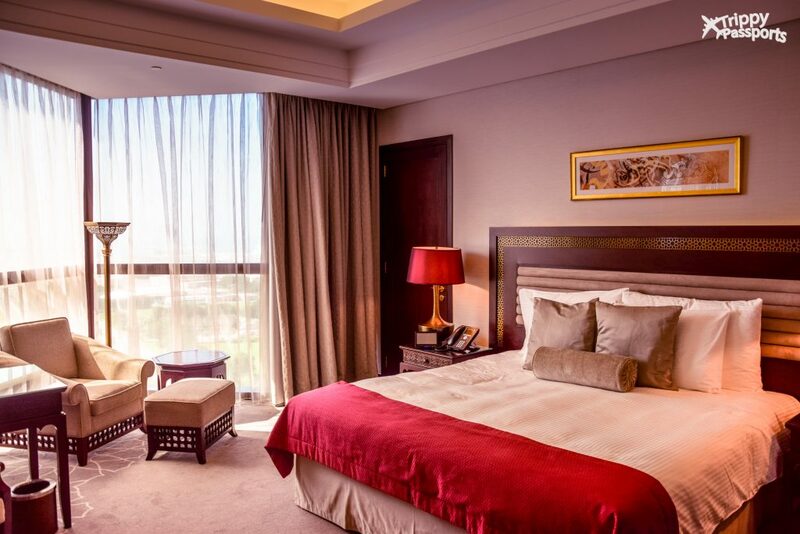 The fairly new Morrocan and Emirati-themed hotel ticked all the right boxes for us – outstanding Middle Eastern food, very comfortable and tastefully furnished rooms, warm hospitality, super prompt service and a rare view of the Emirates Palace from our room on the 14th floor! You can probably guess how beautiful the view would be at night once the lights go on and the city looks dreamy with glittering lights everywhere. Love! The hotel was also very conveniently located right next to the Etihad towers and in close proximity to the Marina Mall. This ensured that we weren’t too far from where we needed to be. Also, did I mention that the hotel houses a private beach at the back of its premises? 😉 Being close to the beach on a holiday is always a good idea! Before you head to Abu Dhabi, also read our complete review of Bab Al Qasr Hotel on the blog. Check out the best rates for this hotel here! UAE has a typical hot desert climate which means that temperature rises to more than 40 degrees Celcius during summers. Temperature is at its peak from June to September, coupled with extreme humidity and intermittent sandstorms. So it is obvious that this is the least favourable time for travelling to Abu Dhabi or any part of the UAE. The period from November to March sees the temperature drop considerably, making it the best time to visit Abu Dhabi. During this time, the morning sun is more bearable than the rest of the year and evenings are nice and pleasant. However, also keep in mind that the cooler months are also very dry as humidity drops. So make sure to keep your body well hydrated and your skin well moisturized. A trip to the UAE cannot be complete without a visit to the vibrant and thriving, albeit underrated capital city. 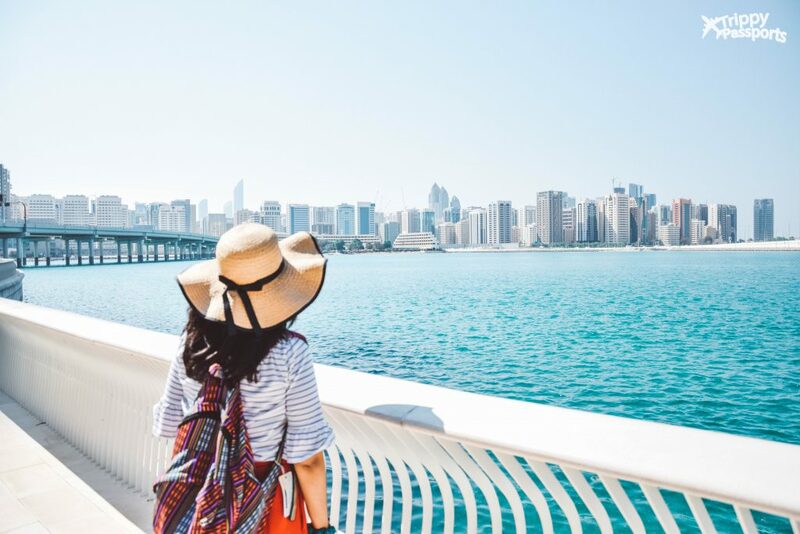 This Abu Dhabi 3-Day itinerary is the perfect way to explore the city and see the best of all that it has to offer, irrespective of whether you are travelling as a couple or with kids. A city where culture, entertainment and modern life seamlessly come together, Abu Dhabi will soon make way into your heart if given a chance! Here is a short video montage of our fun filled 3 days in Abu Dhabi. Please do watch and share the video & subscribe to our channel for more such content! Disclosure: We were guests of Visit Abu Dhabi on this trip and were provided with complimentary activity passes and accommodation. Having said that, all views and opinions are solely our own and are unbiased. I’d like to visit Abu Dhabi and this gives me a good idea of what to expect! Especially with the shopping, thank you! Whoa! That is an awesome itinerary and I would like to go soon on a trip with my family. Oooh, excellent work on putting this guide together! I think you’ve absolutely nailed a 3 day itinerary for Abu Dhabi, well done! I love that you kicked off with a hop-on-hop-off bus tour, I’ve always found that they are great value (in any city!) if you use them right, and it looks like Abu Dhabi’s stops at some amazing locations! I’m also desperate to visit the souks (markets in general, anywhere in the world, being one of my favourite parts of travelling). And, just in case I’m not fangirl-gushing enough, your photos are fantastic 😉 Thank you so much for sharing! This is one of the best Itinerary of Abu Dhabi that I really like, I never been at Abu Dhabi but always search & find something unique about Abu Dhabi. This post is completely awesome with amazing sound.